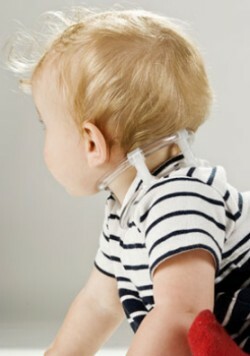 The TOT Collar is designed for congenital muscular torticollis and provides stimulus to the side of the head for infants and adults. A soft tubing loop is connected by two short nylon tubes. Packaged with the collar are different sizes of tubes for custom fit and are positioned anterior and posterior to the crest of the trapezius. The tubing is made of pvc and is fastened with a connecting strap. A spare Velcro Strap is included. The collar is non-toxic and washable, pre-assembled and ready to fit! The collar is provides noxious stimulus to the lateral aspect of the skull, so that the user moves away from this stimulus towards a new, centrally correct position. This resets perception of horizontal position sense and maintains the corrected head position. 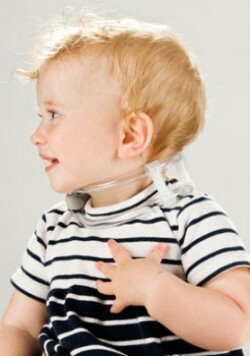 The collar is a means of conservative treatment for infants with congenital muscular torticollis. They must be 4 months of age or older and show a consistent 5 degress or more of head tilt. The infant must have adequate range of motion and lateral head control and strength (head righting reaction) to lift the head away from the side of the collar.